David Arnold Niehaus (February 19, 1935 – November 10, 2010) was an American sportscaster. He was the lead play-by-play announcer for the American League's Seattle Mariners from their inaugural season in 1977 until his death after the 2010 season. In 2008, the National Baseball Hall of Fame awarded Niehaus the Ford C. Frick Award, the highest honor for American baseball broadcasters. Among fans nationwide and his peers, Niehaus was considered to be one of the finest sportscasters in history. —  Calling the final out against the California Angels in the one-game AL West playoff in 1995. Right now, the Mariners looking for the tie. They would take a fly ball. They would love a base hit into the gap and they could win it with Junior's speed. The stretch... and the 0-1 pitch on the way to Edgar Martínez, swung on and LINED DOWN THE LEFT FIELD LINE FOR A BASE HIT! HERE COMES JOEY! HERE IS JUNIOR TO THIRD BASE, THEY'RE GOING TO WAVE HIM IN! THE THROW TO THE PLATE WILL BE LATE! THE MARINERS ARE GOING TO PLAY FOR THE AMERICAN LEAGUE CHAMPIONSHIP! I DON'T BELIEVE IT! IT JUST CONTINUES! MY OH MY! EDGAR MARTÍNEZ WITH A DOUBLE RIPPED DOWN THE LEFT FIELD LINE AND THEY ARE GOING CRAZY AT THE KINGDOME! And a ground ball back up the middle! And there it is! He's the new all time hit king in major league history, number two-five-eight! My oh my! —  Calling Ichiro Suzuki's record-breaking 258th hit off of Ryan Drese, passing George Sisler for the most hits in a regular season. 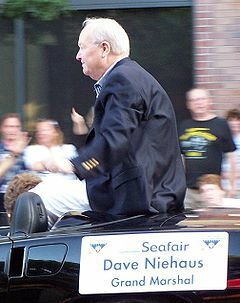 Niehaus suffered a heart attack at his Bellevue, Washington home on November 10, 2010, and died at the age of 75 while preparing to barbecue some ribs on his deck. Heart problems had forced Niehaus to undergo two angioplasties in 1996, causing him to give up smoking and change his diet. He is survived by his wife, three children, and seven grandchildren. In a formal statement, Mariners Chairman Howard Lincoln and President Chuck Armstrong said "Dave has truly been the heart and soul of this franchise since its inception in 1977... He truly was the fans' connection to every game." Washington Governor Chris Gregoire said "Today the Pacific Northwest lost one of its sports icons...Dave was an institution here starting with the team's first pitch in 1977. With all due respect to the great Alvin Davis, Dave is 'Mr. Mariner.'" At news of Niehaus's death, tributes came from Jay Buhner, Ken Griffey, Jr., Seattle Mayor Mike McGinn, other Mariners broadcasters, and fans. ^ a b "Loss of a legend: Dave Niehaus, voice of Mariners, dies at 75". KOMO News. 2010-11-10. Retrieved 2016-07-21. ^ a b c d "Mariners' Niehaus wins Frick Award". MLB.com. 2008-02-19. Retrieved 2008-02-19.